If you are threatened with abuse or you are abused, report it to an adult. If that adult doesn’t listen, tell someone else. That was the message Detective Ann-Marie Tupling left with Sts. 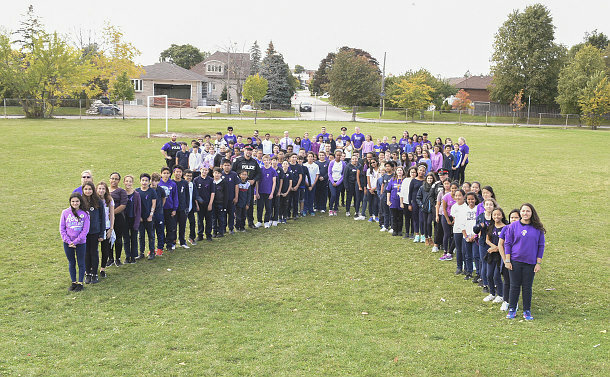 Cosmas & Damian Catholic School students on October 24 at a Dress Purple Day event held during Child Abuse Prevention Month. Several members of the Divisional Policing Support Unit, including Inspector Dave Rydzik, attended the event to raise awareness among students about the signs of abuse and neglect, and what to do if they or someone they know is being/or suspected of being abused or neglected. It’s estimated that one-third of Canadians have suffered some form of child abuse in their lives. 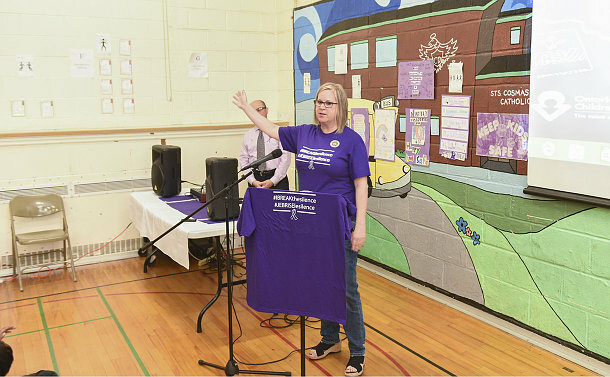 The 2014 study in the Canadian Medical Association Journal, found that 32% of Canadians had experienced physical abuse, sexual abuse, exposure to intimate partner violence or a combination of these while they were young — a number that includes behaviour once deemed socially appropriate forms of discipline, such as spanking with an object and slapping. Del Giudice said every child has a right to a safe childhood free of violence. St. Patrick Catholic Secondary School students created a video, Break the Silence, that was shown at the event.